Ethiopia's coffee ceremony is an integral part of Ethiopian social and cultural life. An invitation to attend a coffee ceremony is considered a mark of friendship or respect and is an excellent example of Ethiopian hospitality. Performing the ceremony is almost obligatory in the presence of a visitor, whatever the time of day. Don't be in a hurry though - this special ceremony can take a few hours. So sit back and enjoy because it is most definitely not instant. Read more! Watch what people say about us! In 1985, Rahel opened Messob Restaurant with her mission being to provide authentic ethiopian cuisine to the residents and visitors of Los Angeles. Her dishes have always been crafted from age-old recipes full of delicious flavor. In 2000, however, she left Messob Restaurant to pursue her higher dream. Rahel opened "Rahel Vegan Cuisine" to fulfill her vision to establish the first ever (and still only) 100% Vegan Ethiopian Restaurant anywhere. She is comitted to preparing the most wholesome, conscious, enjoyable foods without any harm to any animals , to people's health, or to the planet. Anyway one looks at it , a true vegan diet is the optimal diet for all. That is Rahel's vision and passion ! Vegans can rest assured that their meals are 100% vegan and there has been absolutely no cross-contamination with any non-vegan items. There has never been such items in this facility. 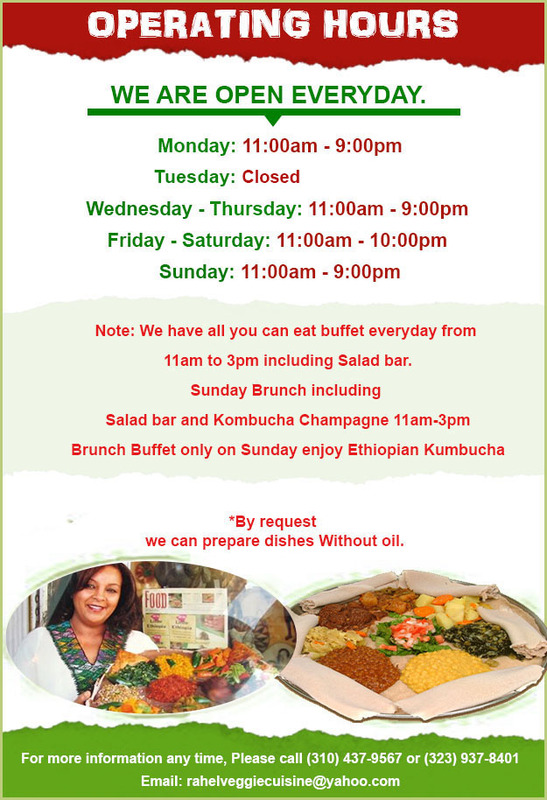 Our customers can rest assured that they are being served the healthiest and most enjoyable Ethiopian Cuisine. Such non-vegan patrons have been delighted to declare,"At Rahels, there is so much variety and flavor and i didn't miss the meat at all!" Rahel also caters to those who have food allergies.For instance,those with nut allergies can rest assured that there are no nuts in any of the meals r even in the facility's food preparation areas. (Desserts with nuts are prepared off-site.) Rahel also offers gluten-free injera,(the aunthentic Ethiopian bread), gluten-free vegan cheese cake, and over 90% of the dishes are naturally gluten-free. Rahel Vegan cuisine has repeatedly been voted, by the people of Los Angeles at LA's annual world Vegan Day Celebration, as LA's Best Vegan Restaurant. 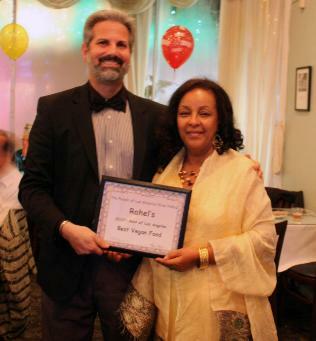 Rahel's has also been awarded Best Ethnic Vegan Restaurant by Los Angeles Magazine.